Are you in need of a battery backup sump pump system? Keep in mind that approximately 14,000 people experience some type of water damage daily throughout the USA. Therefore, getting one suitable for your household is a great idea for pumping water from a flooded basement. This device is essential for keeping the value of your home intact. In order to purchase a quality sump pump, it is important to learn about the different types available on the market. You will now make the right choice with this powerful information. This extensive review will cover what each one entails. Below are the 7 best battery backup sump pumps with many features. I will break down the criteria for picking the right backup sump pump battery system. Finally, the review will end with an overview, troubleshooting, maintenance, and FAQ information. Below is a comparison table outlining the specs, catchy features, pros, and cons. This information could be used later for your final purchase. Everything covered is a brief synopsis of what to expect when making your final decision. Compare the top rated battery backup sump pumps at great prices! Each comparison will detail the sump pumps along with an Amazon Marketplace link to get the product. This information will expose you to some great products with excellent features. You will also learn what are the most popular, reliable, and durable models. 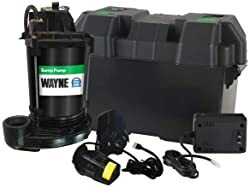 The Wayne WSS30V Sump Pump System is an American made with both domestic and foreign parts. This backup battery sump pump is tested to ensure 1 million lifetime cycles. World-renowned failure analysts monitored and approved this claim. Being a horsepower-operated submersible, it runs on a 75 AMP, 12-volt battery. That means it is capable of pumping out about 4,200 gallons every hour. This machine has a top suction mechanism to minimize debris and limit clogging. There is also a brightly lit LED alarm system indicator that lets homeowners know status updates. Created by an industry leader with over 80 years of experience, Wayne knows basement sewage management the best. Therefore, you can avoid creating a vent or weep hole because this machine does everything for you. The item weighs approximately 24 pounds, so it does not require strain to carry. Additionally, it comes already pre-assembled for quick and easy installation. The exterior has a rugged cast iron, epoxy-coated construction for tough applications and rough handling. Finally, there is a smart charging technology that limits the amount of power used by the DC current. The Wayne WSS30V is a good choice. It is best when you want to support the USA made products. However, it is a bad choice for someone who lives in a basement because of the loud sounds it might make.This system pumps out a bunch of gallons of water with a useful LED system indicator helping the process. There are several more smart features best operable by tech savvy users. Finally, although this machine is very heavy to carry it is durable to last long. This sump pump is a technologically advanced version of the others in the same category. It comes equipped with a free monitoring system with no subscription required. There is also a 120 volt backup battery that runs automatic 24/7. What makes the PumpSpy PS1000 so special is that the system respects personal boundaries by not using Wi-Fi or phone lines. This prevents data incursions. The average battery life is 166 hours of continuous pumping. Moreover, the product weighs about 14 pounds so it is very easy to handle and carry around. The installation is very simple limiting the amount of work on your part. The PumpSpy headquarters is in Northeast, Ohio. Therefore, all parts put inside this company’s sump pumps come from local sources. Moreover, all units have undergone independent, rigorous testing for the ETL listed certification. Some people might feel leery about the monitoring capabilities of this product. It hints at ‘spy’ware technology. This technologically advanced system is perfect for users who are tech savvy. The unit has a monitoring system that does not tap into the home internet or personal mobile devices. Assembly is very easy and installation is effortless. Since this product is the USA made, those with a patriotic spirit will love having it in their homes. It is also independently tested and received an ETL Mark certification. This sump pump has a solid-state design assembled to clean the water pump. It comes with an automatic charger that provides power for maximum battery consumption. Additionally, there is a light indicator that reflects warnings to help keep you on top of the system performance. A low-voltage vertical switch is a great addition to the machine. Moreover, the discharge check valve will give homeowners constant updates. The exterior sports a compact, colorful design that is very stylish. The unit is Crus-approved and comes with the USA made charger. You will get the advantage of a technologically advanced alarm system that comes with an audio dialer. This mechanism contacts you about any problems with the pump. There is also an anti-battery feature to prevt a burnout, providing protection against overcharging. This machine is a bit heavy, weighing approximately 40 lbs. Aside from that, customers will get a three-year limited warranty should anything bad happen. This system offers the full package of a sump pump. However, the only two items that you might need later is a new battery or check valve. Customers do not need to worry because this brand of sump pump has the most advanced technology to clean up water quickly and efficiently. There are plenty of light indicators tapping into the alarm systems for constant alerts about impending issues. The manufacturer is the USA approved, so all systems are made with high-quality products. Stylish and colorful, the unit fits well with a chic household. Although the machine is a bit heavier than others, it comes with a three-year limited warranty. This standard sump pump is capable of pushing out approximately 3,300 gallons every hour. The unit has about 10 feet of lift just in case you do not want this machine sitting on the floor. Capable of creating a 12 volt charge and 75 amp, the maintenance free, deep cycle, or marine cycle batteries are compatible with this machine. A battery is not included. The sump pump housing unit is made of a thermoplastic construction for limited corrosion. There are LED alarm lights displaying alerts and charging levels. A smart charging feature promotes battery saving. Moreover, there is a battery health indicator showing information about the power failure status. All of these systems are connected to the alarm that rings when the backup system activates. This unit is American made with domestic and foreign parts. It weighs about 21 pounds. Expert installation is available for customers who need additional assistance. Moreover, there is a two-year warranty for the parts only. Alarms are loud enough to hear on the first floor. This unit has many fancy technology features that are extremely beneficial for new age users. The sump pump comes fitted with alarms and levers. Because of its high-capacity, expect a high amount of voltage assisting the pump. This high-end sump pump gets the job done with advanced technology and audible alarm features. This 12v high output submersible sump pump delivers a 1260 GPH @ 10′ and 2640 gallons every hour at 0 feet. It is compatible with a marine grade deep cell battery. There are 5 charging levels on the terminal block. However, the battery is not required because there is an easy wiring system with a slip connector for electrical power. This unit is capable of producing about 12 volt/12 volts of power. There is an advanced 3-stage charging LED lighting system with an audible alarm for alerts. Has a check valve with an automatic mercury-free switch. There also is a control panel in the battery box, but a battery not included. The sump pump is made with a thermoplastic material creating a polyethylene design. This submersible sump pump delivers a lot of gallons every hour. There is a marine grade deep cell battery, which needs to be put in water and constant maintenance. LED charging blocks are available for easy charging with slip connectors. There also is a check valve and Mercury switch and the unit has a thermoplastic design. This sump pump has a battery case to accommodate the maximum dimensions. As long as the battery is 13 inches in length, 7 1/2 inches in width and 9 1/2 inches in height it can fit the size. More importantly, this pump comes with a self-contained battery charger made with non-corrosive polyethylene material. The item weighs 21 pounds so it is a nice weight. The power cord stretches 9 feet long. And the housing unit has a cast iron and thermoplastic construction that is non-corrosive. The vertical float switch is sealed to prevent overheating in the thermoplastic base. This process helps extends the sump pump’s lifespan. The pump produces 12 volts of power to dish out about 1380 gallons every hour on a 5in lift. That is about 900 gallons every hour on a 10 inch lift. The LED lighting is available for charging the amp battery. It comes with a 3 year limited warranty, but the product is now discontinued. 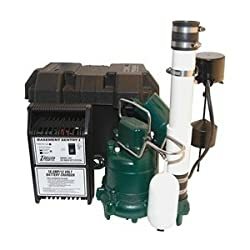 This sump pump is accommodating to most sized batteries and has a self-contained charger. It is very heavy with a long cord. The base material is non corrosive, and has an overheating prevention mechanism that extends life span. This sump pump pumps out a sufficient amount of water and there is a LED alarm system along with a reliable design raise switch. This pump requires a unique Basement Watchdog 7.5 hour standby deep cycle battery that is sold separately. The unit comes with a colorful alarm with LED warning lights. The user-friendly mechanics create easy maintenance for the homeowner. Luckily, it has a battery saver that allows the machine to run without increasing the battery power. There is a useful float switch that provides the protection. All systems have a 115 volts AC electrical current. Moreover, the 12 volt deep cycle battery is compatible with this unit. Made in the USA mostly with stainless steel and some plastic material, it is corrosive resistant. This specific model is capable of pumping out 3,500 gallons every hour at 0 ft lift or 2,200 gallons every hour at a 10 ft lift. All you need is add water to the battery and the pump is ready to go. The product weighs about 28 pounds so it is very manageable to carry. It also comes with a 2-year warranty. This product requires a standby deep cell battery for those who need a long running unit. It also has colorful LED lights displaying the water level. There are alarms that will sound off when issues arise. Customers can enjoy a user-friendly machine. It runs on a high amount of volts, pumping a lot of water in a short amount of time. There also is a float switch to use. Moreover, the housing unit has stainless steel made with some hints of plastic for added corrosion protection. First step is to determine what type of battery you want. Many homeowners will install a solar panel outside about several feet from the garage to charge up backup battery. Although this is not the usual way for a battery to get power, some people find it useful. Therefore, you will need to perform all the modifications yourself. This is the best type of battery for a sump pump that works with the technologically advanced systems. AGM batteries range from maintenance free, deep cycle, to wet cell and marine. A maintenance-free battery does not require constant attention and runs longer. Marine batteries need water and constant maintenance but are more reliable. Wet cell batteries are mostly found in the automotive industry to start cars, so you want to avoid them for a sump pump. This battery has sealed and unsealed versions requiring inspection and more prone to damage and explosions. AGM batteries mostly supply DC currents. Has a lifespan of 7 to 10 years. Choose one with an alarm so you can stay alert to any problems. Always research important information before buying. If you accidentally get one without an alarm, do not worry because you can always install a new one later. Get one that is compatible with a vertical float switch. An electronic switch with an internal sensor that detects water is best. When the water levels drop that pulls down the lever which switches off the pump. Also, when the water rises in the sump pit, the alarm will sound off. Piggyback prong - If there are one or two cords in the back of the unit you can evaluate them yourself. Test them out for piggyback prong compatibility. A tether float switch will activate the pump when the float rises, so look for that. The piggyback prong is a great addition because it controls the submersible pumps that do not have an automatic feature to control themselves. Just insert the prong into the power outlet (as long as a three-prong power plug available). Perfect for failed pump switches. This low-cost alternative is better than replacing the entire pump. What Is A Battery Backup Sump Pump System? A battery backup sump pump system supplements the job of the primary sump pump if there is a power outage. It kicks in when excess water rises and the primary sump pump fails. The actual sump pump machine is usually buried inside a water or sump pit. It is normally equipped with various mechanisms that automatically pump out the flood water. When there is too much water going into the pit and the motor overheats, the battery backup can provide only several hours of protection after that. However, keep in mind that the power eventually runs out. Luckily, other technologies will pick up the pace and come into play. This includes generators and solar panels if you have them installed. A primary sump pump system is normally powered by an AC/DC or D/C current. However, a backup battery sump pump system is normally powered by deep cycle batteries or maintenance-free batteries. The backup battery sump pump has a display panel with an indicator light. This monitors the amount of water being exerted from the home. Luckily, most systems have an alarm that makes loud sounds in case a problem arises. They can also make sounds for corrective actions and maintenance. Another important aspect of this technology is when the dual float switch raises to activate the backup battery. This technology normally connects to Wi-Fi to send text alerts to smartphones that charges happened with the system. When and Who Needs A Sump Pump Battery Backup? Anyone who owns or rents a house need a sump pump battery backup. Sometimes unexpected things happen and the best form of protection is prevention and readiness. Floods cause approximately $6 billion in damages every year. Do not let your home become a statistic! When Is the Best Time to Get A Sump Pump Battery Backup? Anytime would be a great time to get a sump pump battery backup. They are especially needed during hurricane season or after ice storms when the liquid melts. Flash flooding events happen around the country, usually expectedly. Also, if a homeowner does not have homeowner insurance, this is a great time to purchase a sump pump. It literally saves the home and tens to hundreds of thousands of dollars in repairing damages. Another good time to get a sump pump backup battery system is if the homeowner vacations for extended periods of time. This extra layer of protection picks up the responsibility if a water pipe burst or if a storm is impending. Sometimes the homeowner will not know about these events unless they get alerts from the alarm sensor. Heavy storms that create these conditions normally happen once or twice a year. However, flash floods still occur at a higher rate and do more damage very quickly. What Are the Benefits of Using A Sump Pump? A sump pump system will prevent flood water from reaching the walls, carpet, and hardwood floors. This in itself prevents mold from developing and limits nasty airborne pathogens from running rampant. Studies have shown that mold and airborne pathogens can make the family very sick. Moreover, you will save tons of money from repairs. A backup battery sump pump system is perfect for when a fuse blows. In this case, the backup battery kicks in as an enhanced safety mechanism. Another benefit is the highly sensitive sensors installed on a sump pump. They detect rising water levels from the ground up. Once the water touches the sensor, an alarm sounds off. This audio cue helps homeowners stay at a vantage point to fix things before they spiral out of control. Some technologically advanced sump pump systems send out text and email alerts to homeowner’s mobile devices. This system will let homeowners know that the water is rising in the basement. The homeowner just bought themselves more time to perform corrective actions. A sump pump system is also great for houses in the states more prone to flooding. These include the Inland state that is most prone to large-scale storm systems. They are Mississippi, Alabama, Tennessee, Oklahoma, Kentucky, West Virginia, Iowa, and Missouri. Which Type of Sump Pump Suits You the Best? Determining what type of sump pump suits you the best rely on many different factors. The most important one is time. Ask yourself how much time are you going to stay away from the home. When it comes to batteries, the deep cycle marine ones are common. Although they are like car batteries, the most identifiable difference is they require constant maintenance. This is done by adding water every day. Obviously, this is a big inconvenience who stays away from the home for extended periods of time. The AGM battery comes with the latest technology. This battery is more desirable for homeowners who need contemporary tech in their lives. These batteries run 50% longer than the traditional ones lasting up to seven years. You need to decide whether you want a plastic or cast iron sump pump construction. A cast iron design lasts longer than the plastic one, but the former is more expensive than the latter. Another important factor to consider is whether you want an AC/DC pump or a DC-only pump. The AC/DC pump operates from the wall current or battery. On the flip side, the DC pump operates off the battery, but normally last longer and is less expensive. The reason for this is because the electrical outlet is not burning out the battery. Where Are You Purchasing The Product? You need to stay cognizant of where you are purchasing the sump pump. Of course, you are in a better position to evaluate in real life. However, buying online might be cheaper if you can find a used unit from an independent seller. Is It Important To Use an Alarm on the Pump? Alerts to excessive water detection, lost in power, or battery malfunction. Sometimes an alarm comes equipped with a sump pump. Always look out for that spec before making a purchase. Or, an alarm can get installed separately. It depends on you and your skills set. The only downside to getting an alarm is that it might seem confusing or challenging to install. Hiring a professional specializing in sump pump hookups might be the best choice for DIYers. How Long Does The Whole System Will Run On A Battery? Generally, the type of setup implemented during installation determines the battery power. For example, a backup system will reach 2000 cycles on a fully charged 12 volt battery at 75 amp. This means the unit’s battery can last a long time if the system only turns on when water is present. Most fully charged batteries can handle about 13,000 gallons throughout its entire lifetime as long as there is an on and off switch effect that does not stay on forever. What If The Battery Never Turns Off? If the backup pump stays on without turning off, expect a 5 1/2 to 6 hours of battery life. On the flip side, if the pump runs every minute, which is manipulated during installation, then the battery can last 2 days straight. Always factor in the amount of water the machine can handle and the type of battery it has. High quality batteries are more costly and will last longer than the cheaper ones. Moreover, certain batteries that run off AC/DC uses more power than the DC ones. These rules apply to marine and traditional batteries. Sump pumps will help you prevent flooding if there is a power outage, but a backup battery will uphold the power if the primary pump fails. So the backup battery buys at least 24 hours of pump time whenever water comes in the home. This adds extra protection to prevent damages. An extra layer of protection is a backup generator that will assist the primary pump. This is best in the event the actual battery fails or an electric current blows. A generator will help you operate the backup pumps and sump pumps. It also keeps other life-saving appliances such as the stove and refrigerator running. A medium sized generator produces about 5000 watts and a large portable one can produce up to 7500 watts. This provides enough power to restore an air conditioning unit. Monitoring devices can also help prevent flooding because you are always alerted to any problems regarding excessive water and sump pump issues. Another important factor is always staying prepared. Create a good backup plan to ensure every measure gets implemented to prevent the house from flooding. Therefore, having a second electric pump and hydraulic power pump would assist with this. There are many ways to install a battery backup sump pump, depending on your preferences. The electric pump has a routing system that draws water from deep in the pit that goes out of the house. However, if there is no electrical power, then the backup sump pump turns on and take its place. If you decide to install a two-stage system, there is an intricate process involved. 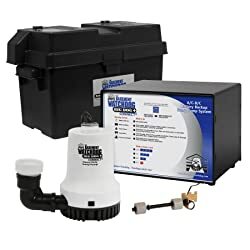 What you need to do is connect a 12-volt deep-cycle, marine battery to the sump pump. You can simply place it inside a plastic bin and bind together the proper connectors, then add water. The first step is to install a check valve preventing water from getting into the sump pump. Then, you want to protect the ends by wrapping the threads with tape. Teflon is the best. Next is putting the battery (marine) into some type of plastic case for protection and then setting it on top of a shelf. You can install a wall mount. However, some people would prefer to keep it on the floor, so it depends on your preference. Next, plug in the charger for the battery. If you are insecure about doing this yourself, then you can call a licensed electrician to help. Never use an extension cord. When the water is pumping, the pipe should extend outdoors on a downhill slope. It is important to have a drain pipe installed leading to the waterway. Check the valve to prevent the water from flowing back into the sump pump. You can cut a 1 ½ inch diameter into the PVC pipe for a discharge. Glue it to the discharge pipe hose clamps and rubber connectors. Test out the operation by lifting the flow valve and then start the pump. The first step is to make sure that your current battery fits the existing sump pump. Do research on your specific model. Keep in mind that you can always seek the help of a professional electrician in case you get confused. Or, you could call the sump pump manufacturer for some advice. Another idea is the YouTube videos and internet articles covering the process. Make sure to connect the backup PVC pipe to the primary pipe. It needs to extend out of the house. Make the check valve stays secure. Separate the check valve for each pipe you want. Install a hydrometer to measure the charge level. Make sure there is no water in the area when doing this. Also, make sure to bind the positive and negative voltage connectors on the battery properly. They are normally identified by different colors. Place the battery in a plastic box after it is fully charged. Get a wrench to loosen the nut on the terminal. Unhook and remove the cable. Never let the cables touch and never let the wrench touch both of the voltage connectors because that can cause a spark. Sump pumps are usually installed in a pit. When water fills the pit, the pump gets activated. It then channels the water that is flooding the area through the pipes. Usually, these pipes organize in such a way to drain water from the building. Besides, they also have a one-way check valve to prevent water backflow. In areas where groundwater frequently seeps through the soil or during unprecedented flooding, sump pumps become useful. They help in keeping the building dry and ultimately prevent severe flooding. Most sump pumps design to operate automatically. This feature is made possible because of a pressure sensor – also called the float activator arm. When there is a flood, water applies pressure to the sensor which then automatically activates the pump. Power surges and blackouts usually occur without warning. Moreover, they happen during the rainy season when floods are imminent. Lack of a backup system for your sump pump puts your house at a greater risk of flooding. Sump pumps usually use AC power to operate. A backup system is therefore necessary, in case the AC power fails. For a battery backup sump pump to work properly a 12-volt deep cycle battery is preferable. This amount of voltage is sufficient to run the pump for several hours. Where Does It Get Installed? Conveniently, the battery backup sump pump is next to the electrical pump. It can then take the role in case the electric pump fails. A battery backup sump pump works using two principal devices; a relay and a DC to AC converter. Electricity flows from its outlet through the relay. From the relay, it is then transmitted to the sump pump. When the AC power gets disconnected as in a blackout or a power surge, the relay switches into a backup mode. When sufficient pressure applies to the pump, it automatically turns on and operates on the backup power. When the AC power is on again, the pump operates on the power from your house and not from the backup. This is a convenient way to always stay on the safe side when there is a flood or a massive ice melt. How the Pump Get the Power? A conventional sump pump is powered by a 110-volt electrical outlet charging the battery to last 1 to 3 days. Technologically advanced pumps are able to limit power to use certain systems by balancing the influx of water. Another way the pump can get power is with a generator when the power turns off. However, this type of system needs to get installed with a bit of tweak and modifications. Lastly, there are the solar-powered sump pumps installed outside getting energy from the sun. Also, this setup has to get installed by the homeowner. You need to always take the proper precaution when working with any electrical charge or battery. Backup sump pump batteries that got damaged in any way need to get disposed of properly. Some big box store such as Home Depot or auto parts stores will charge a small fee to dispose of it for you. If possible, try not to handle these batteries yourself. Consult the help of a professional who is knowledgeable in this field. If you decide to dispose of the battery yourself always keep the vent caps really tight. Another precaution to take is to never smoke cigarettes or spark a flame around the battery. This could set off a chain of events that could lead to a fire resulting in injury or death. Always keep in mind that the white caps are negative and the black caps are positive. Moreover, always make sure to unplug the control unit when you are performing any type of maintenance on the battery, sump pump, or electrical outlet. Call in a professional electrician if needed. Keep anything wet away from electrical currents. Never handle a control unit with wet hands. Avoid stepping or standing on a wet surface anywhere near the battery. If snowing or raining, avoid using the control unit. Stay far away! A good idea is to make sure the unit will not get exposed to these elements during installation. When it comes time to pull the cord, make sure to pull the actual cord instead of disconnecting from the control unit to avoid an electrical shock. Moreover, avoid using an extension cord because that will create an additional jump off point for the electricity. Cheap extension cords could become frayed over time needing replacements and spark currents. Never ever disassemble the control unit. Remember, if you are unsure about how to handle the battery or control unit properly, do research or call a professional electrician. You can also call the customer support center of your unit’s brand and ask the representatives. Just like any piece of technology, if you want a quality product you need to pay a premium price. One downside of purchasing a cheap battery is the inability to hold a charge. This means more electricity for the charging up which could lead to a malfunction. Extremely cheap batteries are usually made in countries that do not have technology regulation, therefore manufacturers use cheap parts to build the battery. This poses a big safety risk since the battery could explode or catch fire. Additionally, most cheap batteries do not come with a warranty, so you cannot return them for a refund or trade. Since these batteries do not operate properly, a flooding event will likely go unnoticed causing permanent damage to the house. Another risk of buying cheap batteries is the defective alarm will continually sound off. This normally happens because of limited voltage power or flawed sensors, further depleting the charge. Listening to these faulty alarms continually sound off all day can become very annoying. Therefore, picking a cheap battery is very risky. How to Use the Battery Backup Properly? Make sure the backup battery stays plugged directly into the sump pump unit. Match the negative and positive cords to the correct ones on the battery. Black is negative and red is positive on the terminal. Usually, this information is found in the instructions that came along with the sump pump. Or you can find it online at the brand’s website. Just search for the specific model. Take a look at the LED to make sure it remains lit. Search for the alarm system to make sure it rings consistently. If you hear unusual noises coming from the sump pump, such as a motor humming, then there is something wrong with the internal wiring. Contact the seller, manufacturer, or repair center for help. Additionally, a constant vibrating unit or a pump that runs all the time is a major problem. When a battery fails, there are many ways you can fix it. Keep in mind that a battery will eventually become nonfunctional sooner or later. As long as the battery stays operational during heavy storms that are all that really matters. It is best to upgrade the battery to a more expensive, reliable version, especially if your current one is not holding a charge. Drainage issues will happen when the sump pump gets clogged up, normally caused by debris that gets caught up in the pipes when they never get cleaned. Moreover, when the float switch turns off and on a bunch of times, changing the water levels, that can cause a clog or jam also. To repair this, get an airtight lid seal to prevent the debris from going inside the pit. If the discharge is frozen or get blocked the IceGuard basement system is a great way to keeping the water in line flowing out the basement. If a sump pump is running non-stop, check the switches to make sure they are not stuck. Also, check for missing valves. How Often to Get Maintenance Done? You should perform a test every 4 to 6 months. Obviously, if you have a flood in this time frame, then you know the pump works. You can perform a test by removing the lid and pressing the float switch. If water gets pumped then the unit is still working. Always check the battery fluid levels to see if any residue has developed on the battery cap. Replace the cap immediately if necessary. Moreover, evaluate the fluid sensor to ensure it is working properly. To prevent the terminal from corroding make sure to clean it regularly and thoroughly. If the discharge gets damaged, plug in the cord to make sure there is not a power outage. Do not use the backup system to test the power, instead try another outlet. Replace the pump if it will not turn on. The potential cause could be related to the AC. If there is a false activation, then switch the cord. If the DC fuse gets blown then there could be a problem with the wiring. If there is a clogging, unplug the power supply and remove the debris. Also, remove the blockage to make sure the system is running fluidly. There are many online guides maintenance guides for troubleshooting hundreds of sump pump models. You can also get in contact with the manufacturer or request a booklet in the mail for more information. 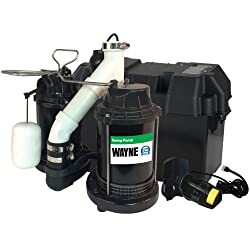 The Wayne branded sump pumps have thermoplastic, stainless steel, and cast iron constructions for durability and reliability. The power and pumping levels for each unit can range from 1/4 to 3/4 capable of managing 4,000 to nearly 5,000 gallons every hour. This popular brand is known for providing the best protection against the worst type of flooding. These sump pumps are made by a Midwestern manufacturer in the Scott Fetzer company headquartered in Harrison, Ohio. The Wayne water system is an industry leader delivering homeowners pumping systems serving the community for over 80 years. Most units come with the latest technological advancements in engineering technologies. Therefore, customers will get quality machines that last long. They have top suction designs that filter debris and minimize clogging, ultimately providing a worry-free water handling solution. Wayne backup sump pumps can withstand the elements from extreme cold to harsh heat. This adds protection, security, confidence, and comfort. Customers will see a great return on their real estate investments. Purchasing high-quality sump pumps will prevent them from paying an extravagant amount of money on home repairs after a flood. Furthermore, Wayne is a reliable brand from a team of experts in the homeowner industry. Therefore, you will get the best protection possible within an affordable budget. Customer service is also available for installations, troubleshooting, and technical assistance. The Zoeller brand has a long-standing reputation for quality, reliability, and performance. The sump pumps have horsepower cast-iron constructions with crew switches, arm handles, and stainless steel accents to reduce rusting. Most Zoeller models can pump a high volume of water above 2,650 gallons every hour. They also produce a high rate of resistance and anti-clogging. They are also well designed for efficiency and proficient handling of heavy loads during torrential downpours. Most machines are very sturdy and durable, capable of handling chunks of debris up to a half an inch. Designed with Triple Safe Systems, these pumps are for people who are in dire need of using one. However, technology savvy users will successfully operate this machine. Most of the units come with a high price tag because of the high quality. Zoeller has many years of experience since 1939. This company has produced top quality sump pumps and water drainage system accessories for water and plumbing solutions. As an industry leader that has gained customer’s trust, most machines sync in a way that meets the needs of many plumbing contractors and water managers. Finally, after your purchase, you will get exclusive access to customer service support. This means reliable advice from an expert staff who cares. Liberty Pumps is a family owned US branded company headquartered in Bergen, New York. It is known for manufacturing quality products locally and shipped wholesale internationally. This company has a range of sump pumps, submersible sump pumps, and backup sump pumps for sewage and wastewater. These pumps have cast iron base materials with aluminum accents and a powder coat finish that withstands high temperatures. Liberty Pumps are best for helping plumbers and water repair contractors do their jobs quickly, effortlessly, and efficiently. The brand has a lot of clout in the plumbing industry for high-end network services. The beautiful thing about this company is that customers can log onto the brand website for more detailed information about each sump pump. Here they will see different models along with specs and features in the descriptions. There is a whole slew of things, including catalogs, troubleshooting, and maintenance information. This company offers quality products at affordable prices and customer satisfaction. The Liberty Pumps company prides itself on safety. Their sump pump system goes through rigorous testing and an external audit by the multinational Registrar Bureau Veritas. This certification ensures each unit is safe to handle and reliable to use. Moreover, customers will enjoy a support system after purchasing for additional help. How Long Does a Battery Backup Sump Pump Last? Although the battery duration solely depends on the type used, most battery backup sump pumps last for a very long time before they drain. Some of these batteries run on AC/DC current while some run on a DC current only. The sump pump battery can go into a reserve mode after an electrical charge, and this enables it to last for a very long time. You can dispose the leftover battery acid so many ways. The first method is to pour the acid into a container, then fill up another container with a large amount of water. Gently add the acid to it and stir continuously. Note: do not pour water into acid because it is fatal and never let the acid touch your skin. Finally, add some quantities of baking soda to neutralize the effect of the acid. You can then dispose of. How Can I Connect Two Batteries Together? You can connect two batteries together by fixing together the two wires at the two terminals i.e positive terminal and negative terminal. The batteries can either be connected in a parallel manner or in series. However, it is important to know that when connecting batteries in series the voltage increases and when batteries connect in parallel the current decreases. 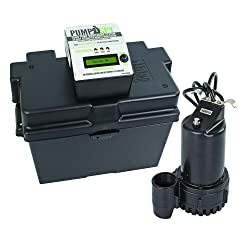 What Size Battery for Sump Pump Backup? For a battery to fit a sump pump backup, it has to be 12 volts and the minimum size 27 unit. You can connect more of these batteries if you desire for a higher gain and longer emergency pumping time. You can also upgrade the charging system by buying larger batteries. What Kind of Battery for Sump Pump Backup? In order to determine the kind of battery that is the best for sump pump backup, you need to consider factors like battery type, pump construction, pump capacity and output, pump technology and the place where the pump gets being purchased. A No Maintenance battery is the best type of battery required to supply quality DC current for sump pump backup. 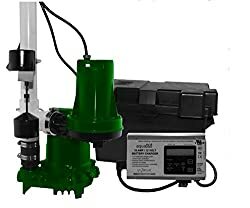 Can I Backup Any Sump Pump With a Battery? Yes. You need to back up the sump pump with a battery to avoid the immediate or accidental shutdown. Since a power outage can make the system to break down, backing up the sump pump with battery is the best option. Additionally, always ensure the battery is kept charged in case of emergency. You have learned which are the best battery backup sump pumps to choose from. Most brands listed here are reliable, high-quality, and offer the top notch service possible. Things such as choosing the right battery, brand, and accessories will all determine how the sump pump runs and lasting protection that will save you tons of money. Some of the best ones to choose are Zoeller, Liberty Pumps, and Wayne. Many of them come pre-assembled, have alarms, made with rust-free materials, and some technological advancements to make your user experience better. Sump pumps are definitely highly-beneficial long-term investments. They can literally protect your home from getting damaged and save your life and pockets!